The completed Hoa Mai Gardens and hillclimb viewed from below the stabilized hillside. The Jackson Street regrade project looking north (c. 1909), near where The Hillclimb and Hoa Mai Gardens projects are located today. The regrade successfully lowered the street level but created a landslide zone that would remain unstable and undeveloped for 100 years. Note the crews installing the hillside tunnel system (just below the headscarp) that would be a central engineering challenge for the Hoa Mai Gardens and The Hillside projects. Before: To stabilize the landslide headscarp, GeoEngineers used conventional soil nailing but faced the headscarp with an engineered wire mesh and cable system connected to the soil nails. After: GeoEngineers used a vegetated engineered mesh to stabilize the top face of the landslide zone. This cost-effective, permeable solution was aesthetically pleasing and could be buried or easily removed when adjacent areas are developed. 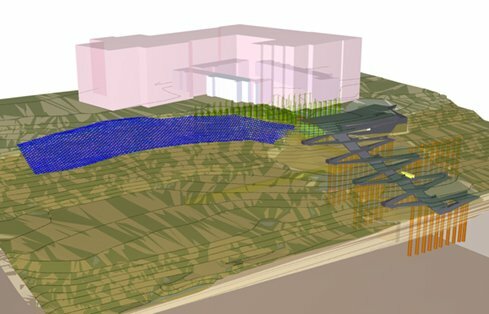 This 3-D model of the site shows the geotechnical improvements at the Hoa Mai Gardens (pink) and the hillclimb (dark gray) site. GeoEngineers stabilized the headscarp (shown in blue), stabilized the hillside mass with drilled shafts (orange) and mitigated the drainage tunnel settlement beneath Hoa Mai Gardens (light green). The northwest corner of the building, showing the exterior entrances of the larger units and the entrance to the ground floor commercial space (far left) and the pedestrian paths. 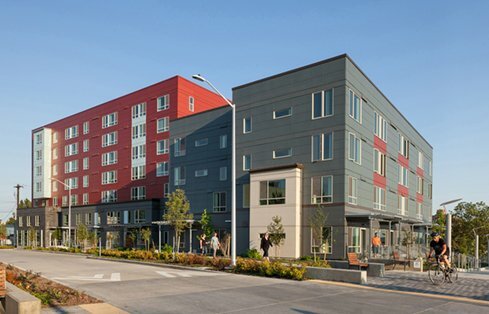 Stabilizing and updating a historic Seattle housing community. Yesler Terrace is a 30-acre low-income housing community located on the southern slope of First Hill in Seattle, Washington. Built in the early 1940s, it was the first publicly subsidized housing community in Washington and the first racially integrated public housing development in the United States. 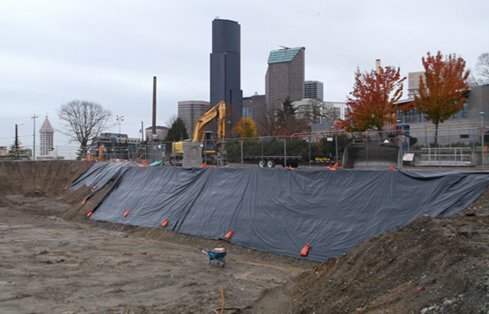 Regrading programs that the City of Seattle conducted around the turn of the century shaped the southern boundary of the modern Yesler Terrace site. In 1907, the city started regrading South Jackson Street using water cannons, lowering it by 65 to 70 feet. But the resulting steep cuts into the hillside initiated landslides. 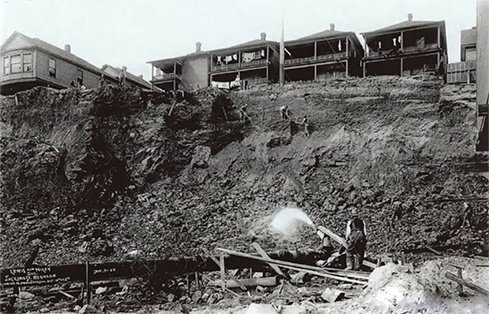 Between 1916 and 1920 the city tried to mitigate the landslide risk by constructing 4-foot by 6-foot, timber-framed groundwater drainage tunnels into the hillside. Unfortunately, this strategy wasn’t effective, and landslides continued between 1930 and 1987. Today, the slope is characterized as an environmentally critical area (ECA) because of the historic landslides and steep slopes. 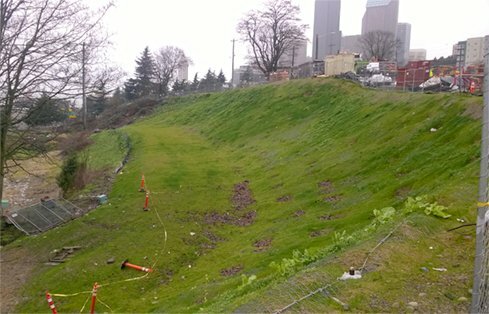 The south side of Yesler Terrace encompasses a large portion of this historic Jackson Street landslide zone. 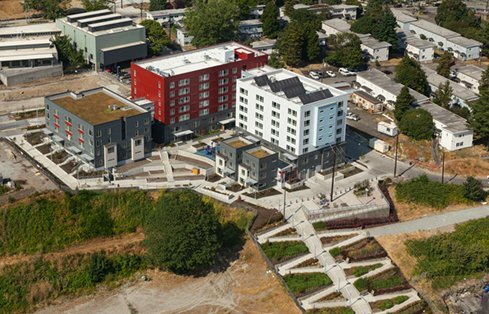 In 2006, the Seattle Housing Authority (SHA) began an ambitious plan to replace the aging structures and redevelop Yesler Terrace. 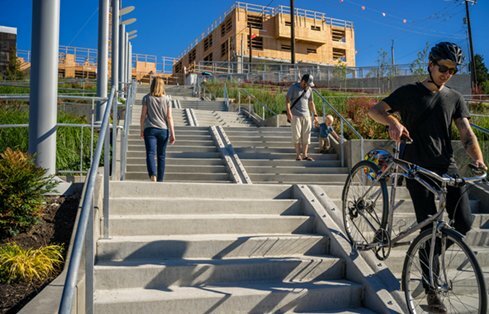 SHA’s redevelopment of Yesler Terrace includes the seven-story low-income residential complex, Hoa Mai Gardens, and The 10th Avenue S. Hillclimb—a 60-foot wide stair and ramp structure below Hoa Mai Gardens. The hillclimb transverses the historic landslide zone and connects Yesler Terrace to the International District and Little Saigon to the south. Because SHA wanted to maximize the available land, their plan placed the Hoa Mai Gardens building as close as 25 feet from the landslide headscarp. Fortunately, our geotechnical engineers were up to the task. Balanced stakeholders. GeoEngineers successfully balanced the needs of multiple project stakeholders, including City of Seattle DCI, Seattle Housing Authority, Seattle Department of Transportation, the International District, U.S. Department of Housing and Urban Development, and the Seattle Architectural Review Board. Navigated the permitting process. The team started by conducting geotechnical coaching sessions with city officials during the design process to share the team’s planned approach and work through any obstacles. GeoEngineers received approval with no comments from the city on our landslide slope stabilization and tunnel filling/compaction grouting-design drawings. Stabilized the landslide zone. The GeoEngineers team stabilized the landslide mass under the hillclimb with a total of 46 50-foot deep, 3-foot diameter drilled shafts. To stabilize the landslide headscarp, GeoEngineers used conventional soil nailing but faced the headscarp with an engineered wire mesh and cable system connected to the soil nails. The team integrated prefabricated erosion control materials into the cable system and finally hydroseeded it for added stability. This provided an aesthetically pleasing vegetated facing allowing for drainage. In total, approximately 9,000 square feet of the headscarp was stabilized, including 211 soil nails up to 35 feet long. Mitigated building settlement risk. The tunnels below the building site were slowly collapsing and posed significant settlement risk. GeoEngineers located and assessed the condition of the tunnels, developed a plan to fill the tunnels and mitigate the soft soils above the collapsed tunnels. The team placed 150 cubic yards of fill in the tunnels to mitigate collapse potential and used a total of 116 primary and secondary compaction grout points to densify the ground above the tunnels. These ground improvement methods allowed the building to be constructed using conventional cost-effective shallow foundations. Implemented cost-effective solutions. The vegetated engineered wire mesh with soil nailing allowed Hoa Mai Gardens to be constructed relatively close to the landslide zone and provided a natural and aesthetically pleasing view from the south, while still allowing drainage through the facing system. The customary approach to stabilizing the upper slope would have been to install a large soldier-pile or shotcrete wall along the scarp face, but the vegetated engineered-mesh solution was less expensive and relatively quick to install. To mitigate potential building settlement by filling the abandoned tunnels with control density fill and using compaction grouting ground improvement techniques, the Hoa Mai Gardens building was designed and constructed using conventional shallow foundations, rather than expensive deep foundations and structural slabs. 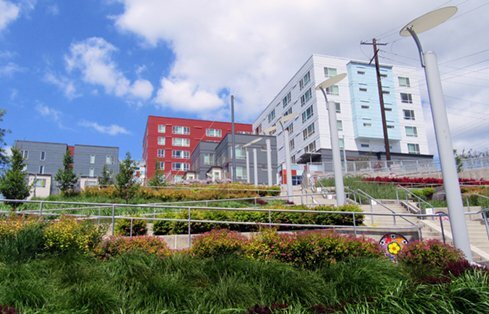 Ultimately, GeoEngineers helped SHA overcome the significant site challenges and settlement risks to complete its vision for Hoa Mai Gardens and connect this low-income housing building at Yesler Terrace to the International District via The 10th Avenue S. Hillclimb.